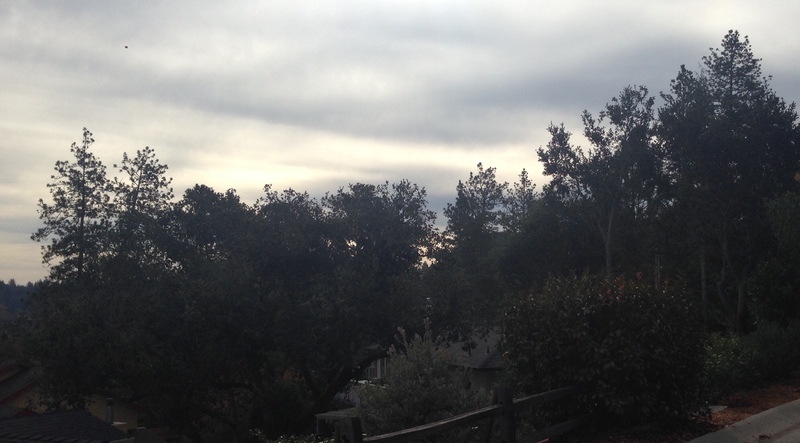 I loved the gray clouds on my walk this morning. I know being thankful for rain might seem a bit strange, but here in California it’s a welcome event! Today, I’m thankful for the rain that’s headed my way! During my walk this morning the sky was cloudy; the air was crisp and cool. It smelled like “rain” is on the way. The intermittent rain we’ve had over the last few weeks allowed green grass to poke through our brown lawn that wasn’t watered all spring and summer. The little bit of lawn we watered occasionally during summer, is now lush, green, and growing for the first time since last spring. I might be mowing the lawn all winter! I’m excited to turn off the drip irrigation for the fruit trees, and let the rain give the trees, bushes, and other native plants a good soak. I’m also excited to see how quickly our rain barrels fill up this year. I’m looking forward to some windy, rainy nights to curl up by a warm fire with one of the many books on my “to read” list, and my favorite Rooibos Chai tea. Since rain is expected late this afternoon, I’m keeping this Thankful Thursday short because I need to get outside to mow our very long grass. And that’s something else to be thankful for, feeling good enough to mow the lawn! Share with me what you’re thankful for today! Categories: Thankful Thursdays | Tags: Rain, Thankful Thursday | Permalink. Beautiful post. I agree completely with your thankfulness for rain! Mowing the lawn? Awesome to hear! Enjoy the beauty today!